Part of your job as a designer is to make sure you present your final design to your clients in a way that they expect (and that makes your hard work shine!). Clearly, they will want to see how your design looks and feels on their actual product — that’s where product mockups can be incredibly helpful. This week we’re taking a look at food, drink, and packaging design mockups. We’ve tracked down some beautiful examples on Envato Elements so, if you’re currently designing a label or package design for a client, some of these might be the perfect way to present your design when it’s done. Enjoy! This is a bundle of 6 different food boxes mockups. It includes different types of carrier boxes used to deliver pastry and food. You’ll find drink boxes, square-shaped boxes, triangle boxes, and more mockups in this bundle. This unique mockup template features a realistic paper coffee cup that you can use to present your coffee branding designs. The mockup comes in an easily editable Photoshop file with smart objects and an editable background. A high-resolution food container mockup you can use to present and promote different types of food, including instant noodles and ice cream products. The mockup includes background textures and isolated shadows as well. A set of 6 unique food can mockups featuring different angles and views of the product. The mockup PSDs arrive fully-layered with smart objects, editable background, and shadows. A set of cardboard boxed drink packaging mockups. This pack includes 4 different mockups you can use to present and promote drinks and liquids such as juices and milk. The boxes are also scaled to 1-liter box, 500ml box, and 300ml box. This mockup features an attractive design of a pack of drink bottles. You can easily edit and customize this design to showcase either soft drinks or beer products. The mockup comes in 2 PSD files with organized layers and smart objects. A set of food can mockups for promoting and presenting preserved food products. This bundle comes with 10 different mockups with photorealistic designs and easily customizable PSD files. This set of stunning juice bottle mockups features 4 different bottle designs with unique shapes. You can use this template to promote juice, smoothies, soft drinks, and more. The color of the liquids inside the bottles can be customized as well. This is a bundle of metal can mockups featuring 10 different mockup templates. This set can be used to promote many kinds of products, including preserved food, coffee beans, tea leaves, cooking oil, and much more. The mockups arrive in 10 separate PSDs. A complete set of mockups you can use to promote a beer brand. This bundle includes 9 different mockup templates, including a beer bottle, beer glass, and packaging. The mockups come to you in easily customizable PSD files equipped with smart objects. This is a collection of mockups that comes with several templates for showcasing designs related to drinks and a bag of chips. It has 7 mockups templates for everything from milk carton packaging to fresh juice packages and more. Another bundle of coffee cup mockups featuring 24 different perspective shots. You’ll have plenty of ways to showcase your coffee cups with this mockups template pack. It also includes 15 background textures. Working on a sports supplement product design? Then this mockups bundle will come in handy. This package comes with 9 mockup templates for showing your supplement products in different sizes and packages. This is an easy to use mockup template for a packaging container. Mostly suitable for ice cream or an instant food product packaging. This template comes in 2 pre-made mockup templates with changeable backgrounds and smart objects for easier editing. With 14 unique and photorealistic mockup templates, this bundle lets you show off soap product designs in a professional way. It also features customizable shadow, reflections, and lights. This is a multipurpose packaging mockup that will work with many types of product packaging. It features 12 pre-made mockup templates for showing your products in different angles and adjustable shading and shadows. Another great packaging templates for a toothpaste, a cream, or a cosmetics related product. This bundle comes with 7 packaging mockup templates featuring smart objects and photorealistic designs. This bundle of branding mockups comes with all types of mockup templates you need for a coffee shop or a cafe, including packaging mockups. It includes over 20 different items and 3 pre-made scenes. A collection of seasoning bottle mockup templates. This bundle includes 7 different mockup templates with adjustable shadows, reflections, and 7 photographic filters. This photorealistic mockup template comes with several real photo items such as a coffee cup, a salad box, paper bag, and more. All of which are customizable to feature your product designs. This is a massive bundle of organic food mockups that comes with over 200 unique food items. You can use them to create your own mockups or scenes for header images. The package also includes 21 pre-made scenes as well. An adorable cupcake mockups with separate cupcake toppers and carton box. You can use this for showcasing cupcakes of your cake shop, restaurant, or cafe. A simple, but an effective, packaging box mockup. This mockup template comes in 9 different PSDs with different angle shots of the box and with 5 background textures. This bundle features 8 different mockup templates featuring real photo mockups, including coffee cup mockups, paper bags, and more. You can easily edit these PSDs with just one-click. Yet another bundle of mockup templates that comes with over 150 different items for creating your own unique mockup templates or header image scenes for beer products or a pub. It also includes 12 pre-made scenes. A box-shaped mockup with a modern design. Ideal for all types of packaging designs from cereal boxes to biscuits, snacks, and more. The mockup comes with 8 template files, including 2 black and white package designs. This foil packaging mockup is easy to customize as it’s been designed with smart objects and changeable backgrounds. It includes 4 pre-designed files with optional shading and shadows. A highly customizable packaging design that features movable objects, shadows, and changeable backgrounds. It’s perfect for showcasing a candy or a chocolate wrapper design. Featuring a realistic design, this energy drink bottle mockup allows you to showcase your design through 9 different shots and angles. The fully layered PSDs even feature automatic background perspectives and 10 background textures. A unique feature of this mockup is its natural look. The realistic reflections and shadows used in this mockup give it the look of a real plastic pouch bag. The mockup comes in 14 fully layered PSD files with customizable colors. A fully customizable mockup for presenting different types of cans. It comes with 9 pre-made designs and changeable backgrounds. This mockup template is ideal for presenting all types of can and label designs. This mockup not only comes with a mockup template for the chocolate wrapper but also includes the chocolate itself as well. It features 18 PSD files, including separate files compatible with CS5 and Photoshop CC. The perfect mockup for Chinese food containers, restaurant, or even for coffee shop related packaging designs. This mockup includes 8 designs based on real-life photography and unique backgrounds. An organic food scene mockup featuring a milk bottle, a menu, business cards, and much more. The natural and vintage look of the design makes it ideal for designing a beautiful billboard for a restaurant or an organic food farm. A realistic looking energy drink can mockup that seems to have achieved the perfect metal and condensation effect. It looks so life like. The mockup comes in 10 PSD files featuring different shots and angles of the can. Another beautiful packaging mockup that comes in two designs, including one with an opened box that can be used to showcase both the product and the packaging at the same time. It’s fully layered and features smart objects for easy editing. This food container mockup is also perfect for presenting your restaurant or a delivery service designs. It features 6 different photorealistic designs with automatic background perspective and editable light and shadows. The photorealistic design of this mockup makes it perfect for presenting your energy drink and soda can designs. It comes with 7 PSD files featuring fully layered and editable designs. Featuring 10 different scenes, a beautiful beer bottle design, and 4 glass elements, this mockup will give you everything you need to present your beer label designs in a way that will wow your clients. This mockup looks ideal for chips and snack product designs. The mockup comes in 3 fully layered PSD files and features smart objects for easy editing with changeable backgrounds. A great mockup for showcasing your sports and nutrition-related product designs, like supplements and bodybuilding products. The pack comes with 12 different mockup designs and 3 pre-designed scenes. This ice cream mockup lets you showcase both your packaging design and the logo design on the ice cream as well. It comes in 6 mockups with customizable backgrounds. An ideal packaging mockup for showcasing designs related to tea or coffee. This mockup comes with 7 designs, 3 textures, and changeable backgrounds. An all-in-one beer can and branding design mockup that features beer cans in two sizes, a business card, and a glass design, all in one mockup. It comes with 12 PSD files, including 4 types of bottles, a keg, menu, and more. An instant food container mockup for presenting your instant noodles and other product designs. The pack features 6 photorealistic mockup designs with editable light, reflection, and shadow controls. This stylishly designed milk bottle mockup will allow you to present your designs in a more professional way. It comes in 3 mockup designs and bottle caps with customizable colors. This paper tube package mockup is specially designed for showcasing coffee packaging designs. It features 4 mockups with beautiful scenes and 3 photo filters. A unique mockup that’s been designed based on real photographs, this pack comes with 10 mockups with stunning sceneries. Perfect for showcasing coffee cup designs and branding. This mockup will help you present your six pack designs for beer packaging. The template features 8 mockups with organized layers and editable varnish. A Starbucks-style cafe mockup design that features live photography. This mockup pack includes 12 different high-resolution designs. A photorealistic mockup for showcasing packaging designs for bubble tea, milkshake, cocktail, and many other types of beverages. It features 9 mockup designs. 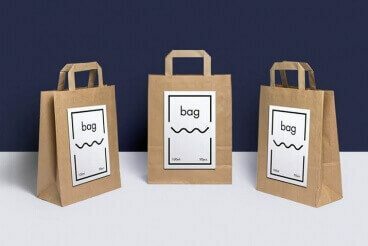 A beautiful paper bag mockup that looks great for showcasing coffee shop or bakery-related packaging designs. This mockup has 9 files feature different shots and angles. This paper cup mockup design will fit in nicely with many types of beverages for showcasing your packaging designs. It comes in 7 PSD files featuring different angles. Perfect for snacks and chips related products, this packaging mockup includes 6 mockup files with customizable reflections, shadows, and separate files with Artboards feature for Photoshop CC. Another paper bag mockup that’s suitable for not only food and grocery related packaging designs, but it will also fit in nicely with many other types of products as well. It comes with 3 high-resolution mockups. An ideal mockup for preserved food designs. This mockup includes 7 designs with layered shadows, items, and backgrounds for easy customization. What’s special about this mockup is its realistic scenery. It’s perfect for a total restaurant or food related branding presentation. The mockup comes with 7 different designs as well. If you’re interested in exploring more mockups, be sure to check out our collection of the best poster mockups for more great designs from Envato Elements.